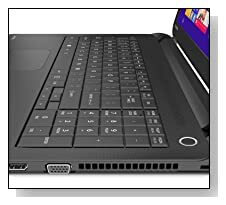 Toshiba Satellite C55-B5298 (PSCMLU-03601M) is one of the latest members of the C50 series computers as an entry level basic power laptop offering features and technical specs that customers would need for everyday simple tasks at quite a low price. It is great for home entertainment, using social media, word processing, emails, photo editing, playing light games and that kind of stuff. 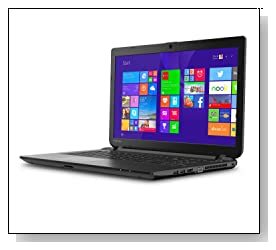 Toshiba Satellite C55 has the 4th generation dual core Intel Celeron N2830 processor at 2.16 GHz, 4GB DDR3L SDRAM at 1333 MHz, 500GB SATA hard drive at 5400rpm spindle speed and Windows 8.1 operating system with Bing as the default search engine with a few user friendly changes and additions to the Windows 8 such as the new Start button with left click that takes you to apps and right click that takes you to the menu that includes Control Panel etc. Celeron N2830 processor (1MB L3 Cache) comes with the Turbo Boost function so 2.16 GHz base speed can go up to 2.41 GHz when needed and stays at 2.16 for usual tasks for power efficiency. It offers adequate multitasking power of usual Microsoft Office and internet with the 4GB of memory but not for complex software and you can’t play the latest games fluently- older titles are fine. 500GB HDD storage is sufficient for most computer users as it gives them quite a bit of of space to save all their files and 5400rpm means fast enough read/write times although standard in modern day computers. 15.6 inch TruBrite LED backlit Active Matrix TFT Color LCD widescreen display with a native resolution of 1366x768 pixel resolution supporting high definition content of 720p, a 16:9 aspect ratio and the integrated Mobile Intel HD graphics offers decent image quality with vibrant colours- the screen has a glossy finish. You can connect to external displays such as your large screen HDTV through the HDMI port with a single audio/video cable for Full HD image and immersive surround sound. Toshiba has the integrated stereo speakers, a full-size keyboard that is comfy to type on with a 10-key numpad to enter numeric data easily and gaming commands. The touchpad supports multiple gestures of pinching, scrolling, swiping or rotating with the simple use of your fingers. Textured resin design with the jet black finish Toshiba Satellite C55 weighs only 4.8 pounds with measurements of 10.20 x 14.96 x 1.05 inches. It is quite a portable device with also the 15.6 inch screen that is the most common size and would fit in your bag easily and the lack of DVD drive that reduces its weight. It may not include a DVD drive but a variety of connectivity options such as the Multi-format Media Card Reader that supports SDXC, SD, SDHC, (MMC and microSD and miniSD with an adapter), 802.11b/g/n Wi-Fi wireless, Bluetooth 4.0, 10/100 Mbps Fast Ethernet with RJ-45, a USB 3.0 port that is ten times faster than USB 2.0 but backward compatible with it, 2 X USD 2.0 ports, VGA port, HDMI port and a webcam with a built-in microphone. Conclusion: Modern and slender design Toshiba Satellite C55-B5298 is a good performer with essential features for a budget entry level notebook PC thanks to the 2014 model Celeron N2830 CPU and 4GB system memory. Just like 93% of Toshiba laptops, the C55-B5298 is Energy Star qualified for power efficiency and allows you to control the energy usage by adjusting the settings through Eco Utility. It is easy on the eyes- looks nice and attractive with the jet black matte finish and clean lines. Neither the Celeron CPU nor the integrated Intel Graphics would be adequate for advanced modern games, complex software and multimedia editing but powerful enough for pretty much any daily tasks and you’re not likely to experience major delays with the smooth multitasking of 4GB RAM. You’re getting quite a lot for your money here and it is the well trusted Toshiba brand after all.